Two days after the events of the previous chapter, the squad is walking through the jungle, again trying to capture Cacciato. They’ve been moving slowly, in single file, looking for any hints of Cacciato’s presence. As the group proceeds, rations are growing sparse, and soon they’ll have no more food. Berlin fantasizes about eating delicious American food and drinking Coke. O’Brien reinforces the futility of the squad’s mission to capture Cacciato in this section—by devoting their time and resources to hunting down Cacciato, the soldiers are risking their own lives, running dangerously low on food and potable water. Doc studies his map and talks to Lieutenant Corson. He shows Corson the group’s progress: they’re nearing the neighboring country of Laos—a dangerous area. Harold Murphy, who carries the squad’s “big rifle,” mutters that the soldiers should let Cacciato go, rather than risk their own lives. Lieutenant Corson ignores Murphy and motions for his soldiers to continue marching toward Laos. As the soldiers continue, Paul Berlin becomes extremely tired. He falls back to walk alongside Oscar Johnson, his fellow soldier. Johnson mutters that there’s no way Cacciato walked the way they’re walking now. Johnson adds that Corson—who’s ordering them to risk their lives—is clearly in poor health. After many more miles of walking, the soldiers arrive at a vast river, which marks the border between their country and Laos. There are no bridges over the river, but Corson orders his man to wade across it. They do so, slowly and carefully. To their surprise, the river is shallow and easy to cross. For the next six days, the soldiers march through Laos. They pass by villages, some of which are deserted. Their days are grueling—they wake up at daybreak, march until the mid-afternoon, and then, after a brief rest, march until the sun sets. Everyone finds the march exhausting, but especially Lieutenant Corson. In this small but important moment, the soldiers reach a seemingly difficult obstacle—a large, intimidating river—and then conquer it easily. In dramatic terms, this is rather unsatisfying, but O’Brien is playing with our expectations on purpose. The pattern of an insurmountable obstacle followed by an increasingly fantastical solution will continue, creating an odd, dreamlike rhythm to the story of the soldiers’ journey, and adding to our sense that these events are the product of imagination, not reality. One afternoon, the soldiers are marching over a small creek when Lieutenant Corson collapses. He’s been suffering from dysentery lately, and hasn’t been dealing with the march well. Doc examines Corson and concludes that “the old man’s had it.” The soldiers drag Corson to a nearby tree, and spend the rest of the day sitting with him. Corson falls asleep, and it’s not clear if he’ll survive the night or not. In this scene, O’Brien seems poised to break another basic rule of drama—eliminating an important character before we get to know the character well. Berlin is portrayed as a young, inexperienced soldier, and Corson seems like his opposite—nihilistic and apathetic, clearly broken by his experiences in Vietnam. The remaining soldiers of squad three decide to have a meeting to determine the fate of their mission. Harold Murphy is among the first to speak up—he argues that they should turn back, rather than risk their lives hunting down one deserter. Oscar Johnson disagrees—he argues that the soldiers have responsibilities to their lieutenant, and shouldn’t ignore these so readily. Murphy points out that without Corson to testify, the soldiers could easily be accused of desertion themselves—after all, they’ve marched into a foreign country, seemingly along the same path that Cacciato took when he went AWOL. In the absence of a strong, central authority—Lieutenant Corson—the other members of the squad argue among themselves. There’s no secret about the fact that the soldiers’ actions resemble desertion: they’re leaving Vietnam, supposedly in search of Cacciato, but leaving nonetheless. All along it’s suggested that the soldiers are eager to go after Cacciato because they want to desert: they’ll take any excuse to leave the horror of the war, although they won’t admit this. The soldiers have listened to “speeches,” and now it’s time for them to vote on what to do next. One by one, they cast ballots by writing down their decisions on pieces of paper. Paul Berlin votes to continue searching for Cacciato, winning the vote for the “go-aheads.” The next morning, the soldiers discover that Harold Murphy has left, and left behind his big rifle. Oscar Johnson picks up the rifle, and the soldiers continue west into Laos without Murphy. The big rifle, one of the more overt symbols in the novel, can be said to mean several things. It’s a large, conspicuous “phallic symbol”—a symbol of its bearer’s power and masculinity. By disobeying orders, Harold Murphy is relinquishing his place in the military, the ultimate masculine institution—thus, he gives up his gun. In another sense, the big rifle is a burden—a cross to be dragged through the jungles of Vietnam. Murphy’s choice to give up the rifle is his way of trying to escape his enormous burden as a seasoned soldier. Arn, Jackson. "Going After Cacciato Chapter 3." LitCharts. LitCharts LLC, 8 Jan 2016. Web. 20 Apr 2019. Arn, Jackson. "Going After Cacciato Chapter 3." LitCharts LLC, January 8, 2016. 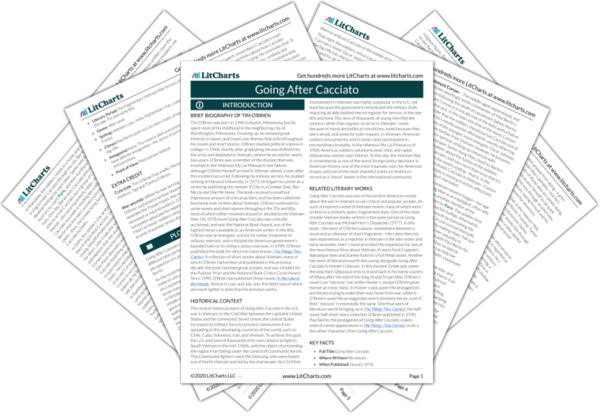 Retrieved April 20, 2019. https://www.litcharts.com/lit/going-after-cacciato/chapter-3.